I had planned to post a silly craft project today but my printer wasn't cooperating. I needed the print to complete the craft. 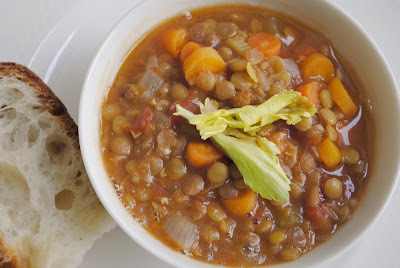 So in replace of a craft project, I decided to share one of my new favorite recipes, French Lentil Soup. I think I've made this soup every other week (that's high rotation in this house). 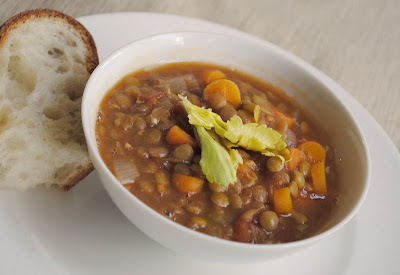 What I like about this soup is it's hearty, healthy, and easy to make. Hope you like it too. 1. In a large pot saute onions, garlic, carrots and celery in olive oil for about 10 - 15 minutes. 2. Add lentils, chicken stock, and diced tomatoes. Bring to a boil then cover and simmer for 35 minutes. 3. When lentils are tender, add balsamic vinegar, salt and pepper to taste. Enjoy. I definitely have to try this. My husband would eat soup three meals a day if he could! p.s. also, stirring in a spoonful of Dijon mustard when serving makes it all the more wonderful! It serves about 5-6 people as a main entree. I usually serve the soup with bread. If you get a chance to make it, please tell me what you think. Thank you for sharing how you make the soup. I'll have try it with dijon mustard next time I make it. Lentils are fast becoming a pantry staple in my house. Thanks for this recipe, will have to try it before it heats up around here. THanks for sharing this-I've been looking for a great recipe! Dinner! I have all of these ingredients in the pantry and a loaf of one hour french bread cooling. Perfect! Thanks for this recipe, will have to try it before it heats up around here.How many servings/bowls would you say this makes? Thanks! thanks for sharing. Looks yummy and easy to make. I made this tonight. I loved it! My husband was worried when he saw how much balsamic was going in the pot, but I loved the flavor boost. Lentil soup definitely needs flavor!